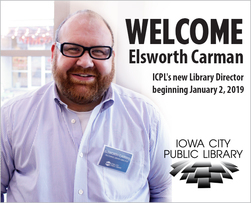 Elsworth Carman is the Iowa City Public Library's new director, taking over the position on Wednesday, Jan. 2. He brings more than 10 years of public library experience to ICPL, having worked at libraries in New Jersey and Illinois, as well as Washington, D.C.
Elsworth served as the director of the Marion Public library for two years before being named director of administrative services for the City of Marion. Libraries, though, remain his passion, which is why he says he's thrilled to join ICPL. "Iowa City is a unique place and ICPL is a special library," Elsworth writes in his introduction message on the Library blog. "Serving the diverse, engaged, and dynamic community and working closely with the committed, skilled, and passionate library staff is a privilege I take very seriously. I look forward to building relationships in the library, in the community, and beyond as I learn more about the people who work with, use, partner with, or are otherwise connected to ICPL." You can read more from Elsworth here. 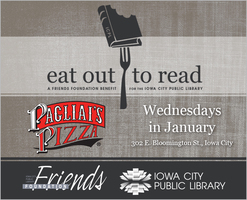 Each Wednesday in January, mention Iowa City Public Library while dining in or taking out at Pagliai’s Pizza, 302 E. Bloomington St., and the Library will receive 25 percent of your ticket. 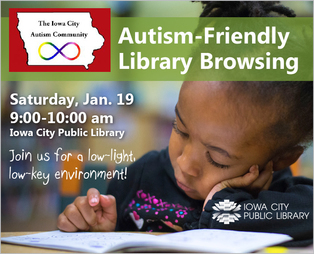 On selected Saturdays, the Library opens one hour early for individuals of all ages with autism, and their families, to enjoy ICPL in a neutral environment. Join us from 9 to 10 a.m. Saturday, Jan. 19, as we celebrate winter. There will be a winter-themed party, including storytime, crafts, dancing, and an indoor snowball fight! Therapy animals will be on hand to wander through the library giving support and friendship. The Teen Center will be open for teens to play computer and video games. The reviews are in and you really like us! Google review: "I absolutely love this library! I always feel at home when I visit and rarely leave empty handed." Twitter: "Shout out to @ICPL and @Lowndes_Library for the amazing work you do for your communities." Instagram: "I love my library. Amazing broad selection. Infinity & Beyond. They are so great to the patrons!!!" We've said it before and we'll say it again: we're lucky to serve such an amazing and supportive community!